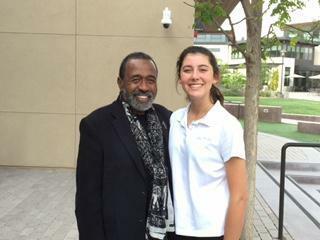 Tony award-winning actor Ben Vereen stopped by Pacific Ridge on Monday, May 3rd. The celebrated entertainer was on campus for a meeting, but made time to drop by the theater room and say hello to Theatre Arts teacher Fredreka Irvine and senior Catherine Ames, who won Best Actress in the 2015 Ben Vereen Awards and went on to compete in the National High School Musical Theatre Awards. Students were eager to show Vereen around the new Arts & Technology Building and hear about some of his initiatives to make the arts accessible to all. Catherine Ames received word this week that she was once again nominated for the Ben Vereen Awards. While the senior will be unable to attend the competition this year, she can bask in the glow of another nomination and her friendship with one of Broadway's most revered performers.